Philippine authorities scrambled to provide food and other emergency provisions Saturday to more than two million people affected by widespread flooding, as the death toll rose to 66, officials said. 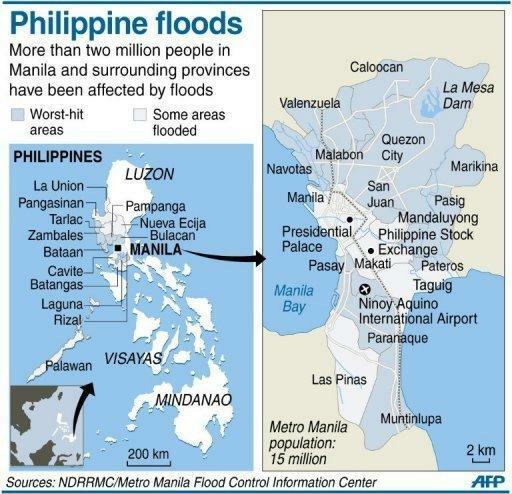 The flooding that submerged 80 percent of Manila early in the week has largely subsided, allowing people to return to their homes, but more than 100 low-lying towns and cities to the north remain under water. Civil defence chief Benito Ramos said the huge displaced population, including 441,000 people crammed in crowded evacuation camps, would need to be fed and taken care of for at least another seven days. "The bulk of our operations involves relief, but also clean-up," Ramos told AFP. "Volunteers are packaging 100,000 food packs for immediate distribution." The government's disaster co-ordination council said it was serving nearly 758,000 people displaced by floods on Saturday, significantly more than the previous day as tens of thousands trickled into evacuation centres overnight. But with 2.68 million people affected, up from 2.44 million on Friday, many are having to fend for themselves. In Calumpit, a farming town about 50 kilometres (30 miles) north of Manila, unmarried construction worker Ronaldo Cruz stepped out of his house, stuck in waist-deep floods, to ask for food from better-off neighbours and relatives. "We've been waiting for relief aid, but none has arrived," said the 32-year-old, who lives with seven other relatives. "Perhaps there isn't enough to go around," he told AFP. 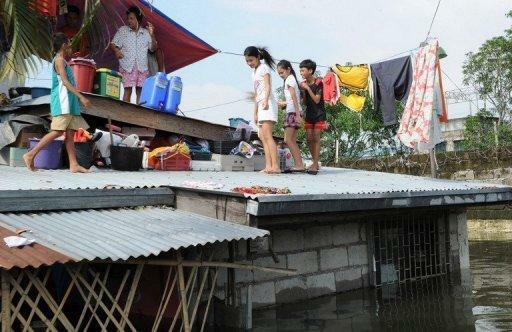 With evacuation centres packed to capacity and houses inundated by flood water, many residents of Calumpit are forced to live on their rooftops. The UN World Food Programme said it was providing 52.5 tonnes of high-energy biscuits and hiring trucks to help the government transport other relief supplies. "WFP is saddened by the humanitarian impact of the non-stop rains over the last week in the Philippines," its country chief Stephen Anderson said in a statement. The UN body said it also plans to distribute supplementary food to about 77,000 children in the flooded areas. The government said Saturday that 66 people had been confirmed killed, up from 60 on Friday. The Philippines endures about 20 major storms or typhoons each rainy season. But this week's rains were the worst to hit Manila since Tropical Storm Ketsana killed 464 people in 2009.